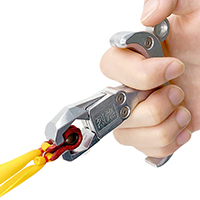 The professional pocket slingshot is made from superhard 440C stainless steel. The surface is coated with titanium, making it hard to fade and more wear resistant. It is mirror polished for a brighter and extraordinary appearnce. The design of "S" curves allows the slingshot tightly held in the palm of the hand to provide a stable shooting. This hand catapult is great for collection or hunting outdoor.